When Treetopia asked me to participate in their 2016 Design Council, I was more than thrilled to say YES! 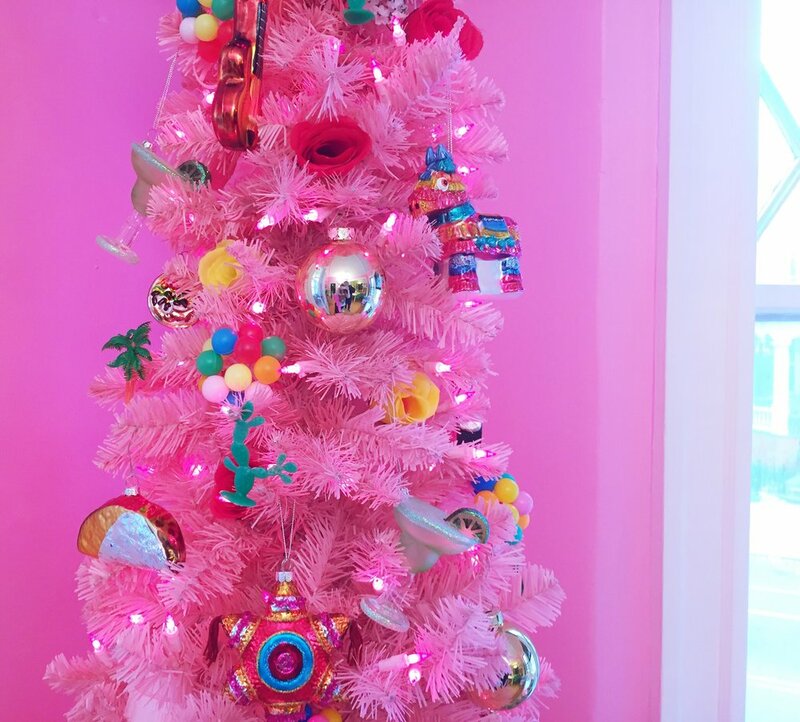 I have always wanted to order a pink holiday tree from their web store, but with life being so crazy, the holidays just always snuck up on me and I never got the chance! The theme of my Christmas tree this year is South Texas. I was born and raised in Corpus Christi, and although I no longer live there, it will always be my home. I am often very homesick for my family and my South Texas heritage, so I decided my tree should be a reflection of all the happy things that remind me of my hometown! I started with an assortment of novelty glass ornaments. Tacos, burritos, avocados, margaritas and chili peppers (because Mexican food is part of daily life down there!). Cowboy hats for my dad! Balloons and piñatas for fiestas (and my favorite things to shop for at home). Cactuses, palm trees (yes we have palm trees in Corpus Christi) and yellow roses for The Yellow Rose of Texas. Red roses for Selena, Como La Flor! Pink bicycles, because I left my beloved pink bicycle at my childhood home. I ride it every time I'm there! Every detail I picked had a special meaning and significance! I finished off the tree with decorative gold balls, disco balls and these beautiful glass icicle ornaments from Treetopia. Here are some process pictures from start to finish! I didn't really get any pictures of the bare tree because I was so focused on decorating it I completely forgot! I hope you like my tree! What are some of your unique family holiday traditions? I would love to hear! Thanks for taking a peek!